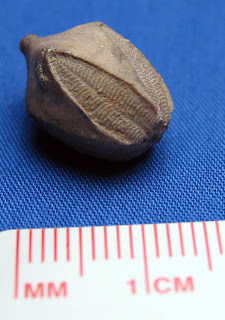 The Pentremites blastoid named by Thomas Say in 1825 (maybe in the Journal of Academy of Natural Sciences of Philadelphia, volume 4, p.294). These fossils were found in Crawford County, Indiana (maybe Indiana Springs Formation). The creatures existed in the Mississippian Period. Dr. Gerard Troost makes note of genus in his unpublished manuscript on crinoids from 1850, "The Genus Pentremites established by our countryman Thomas Say and on which I wrote a memoir (Trans. of the geol. Soc. of Penn. vol. I pag. 224.) is so well known that it requires merely a short notice of how the several species differ from one another; and as to my knowledge, no good figures have been published of the American Pentremites," He also talks about Thomas Say's observations in "On The Pentremites Reinwardtii, A New Fossil: With Remarks On The Genus Pentremites (Say) And Its Geognostic Position In The United States Of Tennessee, Alabama, And Kentucky" by Gerard Troost in Transactions of the Geological Society of Pennsylvania, Volume 1, 1835. Gerard Troost, Thomas Say, and Charles-Alexandre Lesueur were all at New Harmony, Indiana in the 1820s & 1830s. These fossils shown in this entry were not found too far from there to east. It appears they did not document the blastoids found in Indiana since Troost does not mention the state in his paper previously quoted. 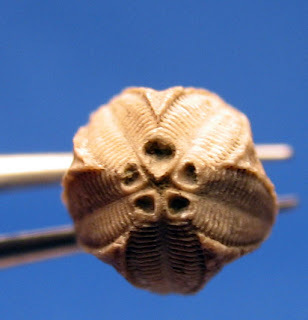 From the species he attributes to Say in the second paper, those blastoids appear to be found in England, Tennessee, and along the Mississippi River. Thomas Say is buried at New Harmony. Journal of Paleontology, Vol. 35, No. 4 (Jul., 1961), pp. 868-873 talks about the holotype specimen of Pentremites godoni found in Kentucky was destroyed in fire (between 1827-1850). 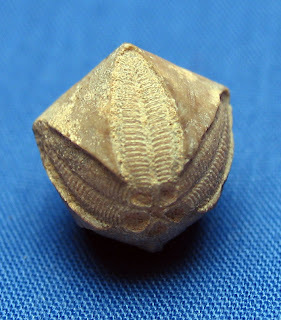 It was originally decribed Parkison in 1808 as "Kentucky Asterial Fossil". 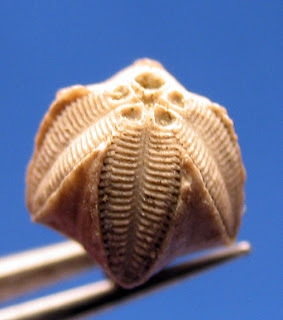 Professor Samuel Latham Mitchill of University of New York described it as having "a remote resemblance to a small acorn" in 1808 (Uncommon Petrifactions, from Georgia and Kentucky). It goes on using plant terminology so early thinking was it was some sort of vegetation.